Canine Obesity is a major problem in today's dogs. 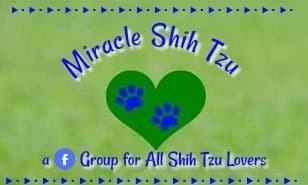 Perhaps you'd like to ignore the situation, but if your Shih Tzu is overweight, you are cheating him out of the chance to live the best possible life. Shih Tzu dogs are not alone in this problem, as many small breed dogs can fall victim. Overweight Shih Tzu are at increased risk of developing painful conditions like osteoarthritis and life-threatening ones like respiratory, cardiovascular disease, Type 2 diabetes high blood pressure and many forms of cancer. No one likes to think about their dog suffering from a life threatening disease. We all know that it is very costly and difficult to treat these diseases once they have been established. Prevention is much cheaper and easier. But, beyond the cost factor is the health, well-being, and lifespan of the dog. The bottom line: They need to go on a dog diet and get more exercise. The problem of obesity in our pets is on the rise. According to the the sixth annual National Pet Obesity Awareness Day Survey conducted by the Association for Pet Obesity Prevention (APOP) found 52.5 percent of dogs and 58.3 percent of cats to be overweight or obese by their veterinarian. That equals approximately 80 million U.S. dogs and cats. Sadly, it’s not just the Shih Tzu, but many other toy breeds that are at risk for obesity. Shih Tzu are not as active as some small breed dogs and one of their favorite pastimes is to cuddle up on your lap. It’s so easy to enjoy their company and their pure relaxed contentment on your lap that you forget they need exercise, too. Another problem that Shih Tzu owners face is a two edge sword. These dogs learn very quickly. In a weak moment, you give them a great tasting snack and they will never let you forget it. Too little exercise and too many high calorie snacks only lead to one thing. And, canine obesity is a serious health concern. Your Shih Tzu is at your mercy when it comes to meal and snack time, and the only discipline being exercised in doggie's diet is yours. It is not always easy to look beyond those gorgeous round pleading eyes, but when you give in to your Shih Tzu, you may be doing him more harm than good. 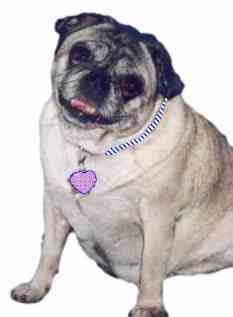 Many of our beloved pets are not living out their life expectancy due canine obesity. As with humans, if your Shih Tzu is overweight then she is taking in more calories than necessary. Period! If your Shih Tzu is overweight and is otherwise healthy then she is eating way too much and/or not getting the exercise she needs. Sometimes there is a medical reason for a dog gaining weight. If your dog is experiencing weight gain, you should have him examined by your Vet to check for heart, thyroid or other metabolic disorders to rule out a possible medical cause. Some common diseases associated with weight gain include hypothyroidism and hyperadrenocorticism, or Cushing’s disease. Shih Tzu dogs as a breed are prone to thyroid problems. Be honest with your veterinarian about how much or how little exercise your Shih Tzu gets, and how often, as well as how much you feed, what and when you feed, and how often you treat. This step requires you to become aware of just how much food the dog is actually consuming over the course of a 24 hour period. The veterinarian might be able to prescribe a weight reducing diet if other medical problems have been ruled out. s"Lola won't stop pestering me unless I give her a treat and she won't settle at night unless she gets his special sausage treat." Good for Lola! She has successfully learned how to manipulate this owner into a treat for herself. Talk about negative conditioning here. Lola’s owner hasn't trained her properly to have some manners and instead Lola has managed to train her owner. She knows exactly what being a nuisance will do—it will get her a treat and eventually the pounds start to mount on her. There is no shortage of dog treats on the market today. Just visit a supermarket or pet store and you will notice that there is often an entire isle devoted to treats alone. Giving a dog a treat without making them work for it not only hurts the relationship, it undermines any training you are doing and it puts on extra pounds. Dog treats are only part of the problem. As humans, we like to snack, especially while watching TV. 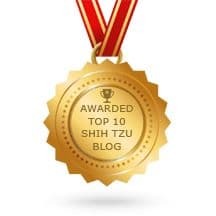 If our favorite canine is snuggled closely, it’s very easy to give him the same foods you are eating without paying much attention to the amount your Tzu is consuming. "Charlie won't eat dog food." So, then what does Charlie eat? You got it, table scraps and whatever it wants. Here we are not describing a well-researched home cooked diet, just what’s left over when the people finish eating. Oftentimes overweight dogs also become ones who are excellent at begging at the table. It only takes a couple of times when an owner is in an overindulgent mood to get the begging habit started. Once little Charlie, the Shih Tzu has succeeded in training the owners to give him what he wants, then the habit gets entrenched in both the dog and the owner’s mind. As we all know, habits are hard to break. Sadly, though the dog is paying the price for it physically. Shih Tzu are much more likely to prefer food from his owner’s hands then a dog bowl. Here again, the dog is not getting the proper nutrition, but has learned still another bad habit: Begging. Just How Many Calories Does the Dog Consume? We think about dog food normally when we try to determine how much our dog is eating, but there are many other factors to consider. Of course the calorie content of the dog food is important and how many calories are contained in the daily meals. Consider treats for training? How many calories are we adding here? 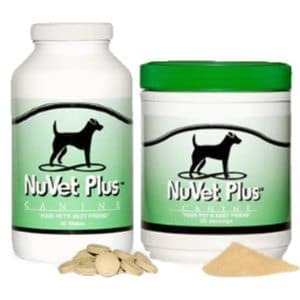 Does your dog have any supplements that she takes regularly--nutritional vitamins and minerals? How about an extra squirt of Omega 3 Fatty Acids in the form of Fish or Salmon Oil? There are more calories there than you might think? Does your dog use dental chews daily? Those add to the calorie intake. Other forms of chews can also add some calories if they can be digested. Table Scraps? A green bean here, a bite of chicken, some left over sweet potatoes? They are all nutritious foods for your dog, but they add to the total daily calories. Does your dog need to take a pill or two everyday? Do you hide that pill in some sort of food or a pill pocket. That food adds to the total daily calories. Does your dog go out and scavenge? Historically dogs were scavengers. We might not like to think about it, but everything the dog consumes has the potential to add calories. Check the label to determine how many calories are in each cup of dog food. The calorie count varies between blends and between brands. 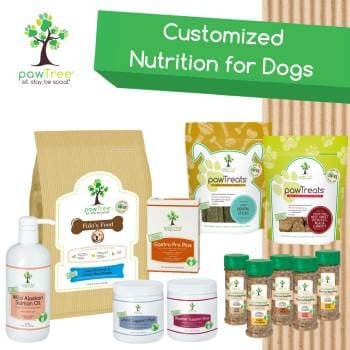 Commercially prepared dog foods that are intended for inactive dogs or those who want to loose weight will typically have more carbohydrates in the form of non-digestible fiber. The thinking behind these diets is that with larger quantities of fiber, the dog will consume the same calories but fill satiated and not want more food until the next meal. These weight loss diets will also be lower in fats but still maintain the protein in adequate amounts. The best way to determine what is right for your dog is to have him examined by a veterinarian and ask for diet recommendations. While many commercial diets are available over-the-counter, some prescription diets only available through a veterinarian may be another option. As a breed, Shih Tzu does not need a ton of exercise. They can often get most of their requirements by following you around the house every day. Some enjoy a quick burst of energy where they run wildly seeming to enjoy every moment. They also enjoy short brisk walks with their favorite human. But what about those dogs who are confined to small spaces while the owner works, does not have opportunities to move about the house or take walks. These dogs are at risk especially if they also enjoy a high calorie diet. Before you decide to put little Charlie on a diet, check with your veterinarian. Get an accurate record of his weight and determine the ideal weight for his breed. The standard for the Shih Tzu Breed states that they should weigh between 9 and 16 pounds. Their weight should be proportional to their overall size. Your veterinarian will be able to tell you how many daily calories your dog can consume and still begin to lose weight. This amount must include all the extra table scraps, treats and doggie cookies you are now feeding. Next you will want to become fluent in reading dog labels to find the best dog food that Charlie will eat. The easiest way to manage a diet is to remove all treats entirely and then substitute them for something healthy and low calorie such as carrots, celery, broccoli or asparagus. Many dogs love the crunchy feeling that accompanies nibbling on raw veggies. First take a good hard look at the food you are feeding. The FIRST ingredients present in the bag of food should be MEAT or meat products, NOT grains like corn. Look at the first five ingredients and compare two or more brands. Premium or higher quality dog foods will have more meat, fish or poultry as the main ingredients. 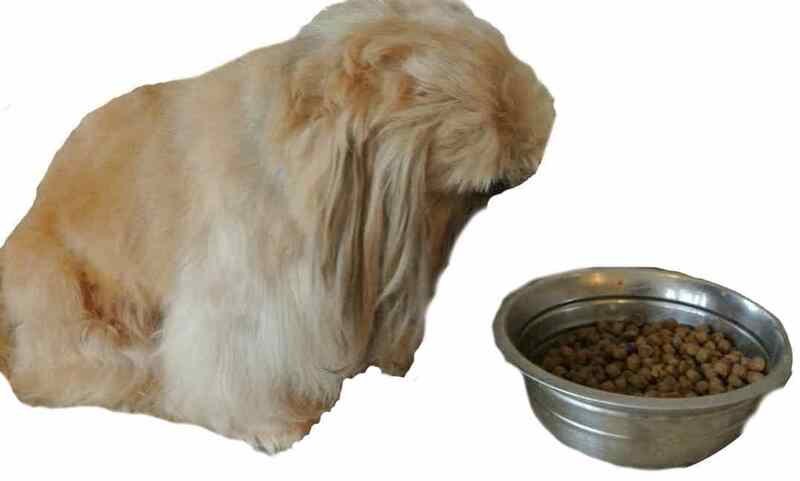 Shih Tzu dogs do much better on commercial diets that do not contain the grains, corn, wheat or soy. If you're wondering about low calorie diets for dogs, you can purchase them, but many vets don't like to recommend them as they have very restricted fat levels. When they produce dog foods with reduced fats, the carbohydrates are increased. When dogs ingested additional carbohydrates, their bodies must produce extra insulin. What happens is that the extra insulin production tells the dog’s body to store the unused calories as fat. It becomes a vicious cycle. In the meantime, if he begs – do NOT give in. If he has finished his bowl of food and looks expectantly at you for more, give him a bowl of fresh water instead. If you must give him something when he begs, offer him a couple pieces of his normal kibble. Sometimes this works because it has your scent on the food. If he refuses, shrug your shoulders and walk away. At the end of two weeks, weigh him again. If Charlie has lost some weight, great, then stick to this schedule. If he hasn't lost any weight, reduce his intake and also find out if someone else in the house is sneaking treats to Charlie. Doggie Diets are only successful if everyone in the household is on the same page. Exercise is important especially for dogs that are overweight. To benefit from a walk, however, requires you to pick up the pace. A casual stroll stopping every few minutes to sniff is not going to burn off many calories. A short brisk walk is better for this breed than a long leisurely stroll. Play Fetch: Not all Shih Tzu dogs enjoy this game, but if yours does, by all means play it daily. Your Tzu will get plenty of exercise and you will have some great bonding time with him as well. Does your Tzu get those bursts of energy where he runs wildly in a room or between rooms? If possible, encourage this, but don't overdo it. Remember, Shih Tzu dogs are a brachycephalic bred and as such cannot tolerate as much as their cousins with long noses. Always offer plenty of cool fresh water during and after exercise and if the weather is especially warm, limit exercise times to early morning or evening when temperatures drop. We all love our pets and want what is best for them. Sometimes we tend to kill them with our kindness by providing unhealthy diets. There are far better ways for us to show our love than with too much food. Your pet will almost certainly enjoy spending more time on walks or playing games with you than he or she will when eating alone. There are plenty or nutritious foods which have loads of doggie palate appeal out there, so you should never feel like Charlie is missing something by not dining at the family table.